Ever wondered why it’s so hard to give straightforward answers to people who ask you about your religion? Not to worry! We will go over the basics and FAQs of Shin Buddhism so that you can impress your friends and family with simple and to-the-point answers. We encourage all to come! Please join us in welcoming Rev. 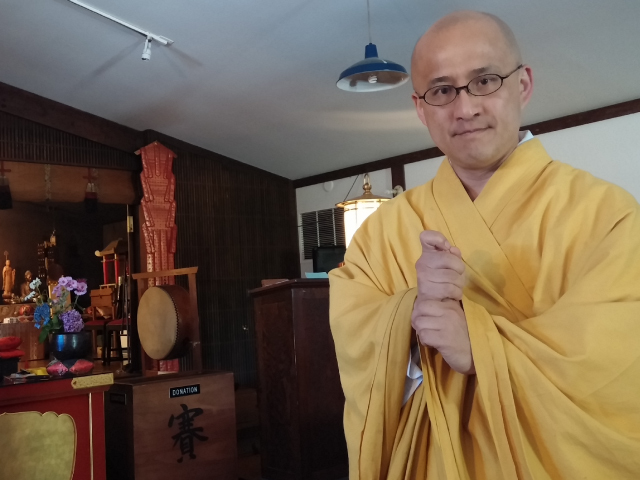 Taijo Imanaka, resident priest of Seattle Koyasan Buddhist Temple, who will be our guest speaker for this Sunday’s 10AM service at the Betsuin. Seattle Koyasan is a temple in the Shingon sect of Japanese Buddhism. Sensei’s temple is located just one block away from the Seattle Betsuin on the north side of Wisteria Plaza Park. The Shingon sect traces its origins to the lineage founder, Kobo Daishi (the Monk Kukai) who brought esoteric Buddhism to Japan from China in the 9th century C.E. Sensei’s presentation includes an overview of Shingon Buddhism including photos of the mother temple on Mt. Koya which is registered through UNESCO as a World Heritage site. Click “more” for the event flyer.